The design consensus on the Burj Al Arab  the sail-shaped hotel that helped put Dubai on the tourist map  is that while the exterior is agreeably streamlined, the interior is way too ostentatious. The new pyramid-shaped Raffles, dubai.raffles.com, evokes more general approval, however, with the understated grandeur of its sloping frontages heralding refinement and good taste within. But then that's not much of a surprise, given the imprimatur of Raffles Hotels & Resorts, which aside from operating a world-famous flagship in Singapore, also runs stylish hotels in Beijing, Phnom Penh, Siem Reap and Beverly Hills, and now this latest property, owned by Sheik Mana bin Khalifa Al Maktoum. The sheik's interest in Egyptology is translated not only into the shape of the building, but also into columns painstakingly carved with hieroglyphs and other decorative touches. Granted, an Egyptian theme doesn't sound subtle, but somehow the 248-suite hotel manages to avoid looking like a Vegas casino and more like a desert palace in muted colors. 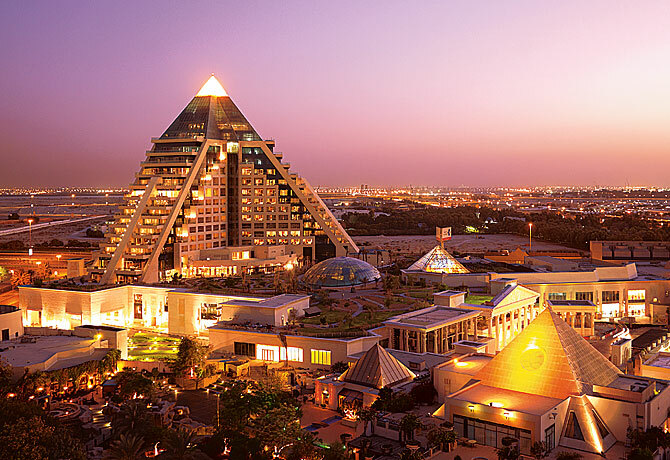 There's a lush tropical garden with 129,000 species of plants, a six-room spa, an adjoining upscale shopping mall (Wafi City, also owned by the sheik) and 11 restaurants and bars, four of which are located under glass at the pyramid's peak. Suites are sizable  the smallest is a generous 750 sq. ft. (70 sq m)  and all come with a spacious patio. Service is rather incredible. You only have to clear your throat and staff come running. The pharaohs would doubtless have approved.